DataFest is a nationally-coordinated undergraduate competition in which teams of up to 5 students work over a weekend to extract insight from a rich and complex data set. Previous years’ data sets have included crime data from the LAPD, dating data from eHarmony, and energy use data from GridPoint. This year’s data set will be revealed at the opening of the event on Friday evening. At the conclusion of the competition, each team will have 5 minutes to make a presentation to a panel of judges. Each panel of judges will select a team for the “Best in Group” prize, and the entire group of judges will determine a “Best in Show” prize. Other additional prizes may be awarded. 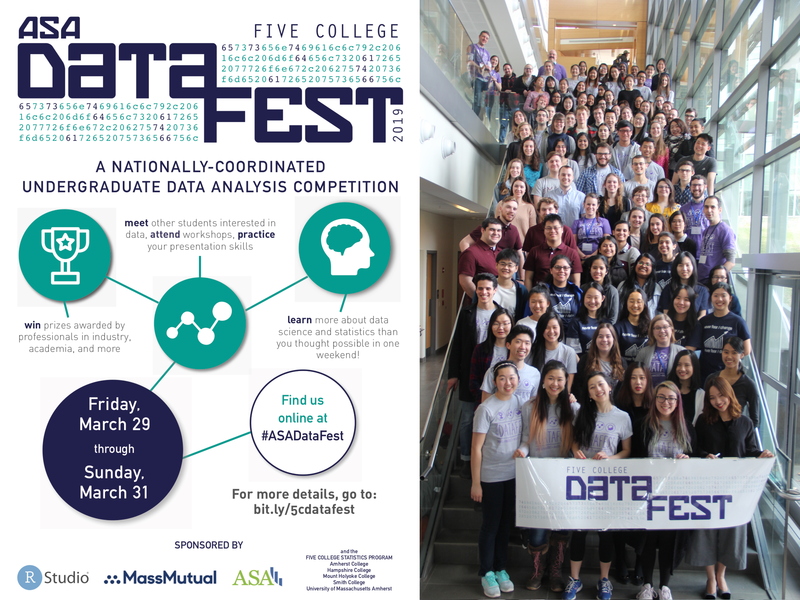 The mission of DataFest is to expose undergraduate students to challenging questions with immediate real-world significance that can be addressed through data analysis. By working in teams, students with varying skill sets will combine their efforts and expand their collective data analysis horizons. Interaction among students, as well as with outside consultants will promote the sense that data analysis is a dynamic, engaging, and vibrant part of our society, as well as a realistic, practical, and fun career path. Prizes, fame, glory, or some combination thereof… And you get a free t-shirt! All you need is a laptop with tools for data analysis (there is no limitation on which software you use) and enthusiasm for data. No more than five students members per team. Team members can come and go as they please but all work has to be done on-site. A steady supply of food, beverage, and snacks make it more inviting to stay. It’s a competition, but a friendly one, so collaboration between teams is not only allowed but highly encouraged. Official DataFest consultants (grad students, faculty, etc.) will also be around throughout the weekend to help with any questions you might have. However you can’t have outside help. No. You may come and go as you please. However, you are only allowed to work on the project while you’re on DataFest grounds, and at least 3 members of your team must attend the introduction. The competition will be put on hold between midnight and 8 am both nights, so that everyone can sleep and return refreshed and with new ideas. Where else is DataFest happening? Anything else I should know about DataFest? DataFest is also a great opportunity to gain experience that employers are looking for. Having worked on a data analysis problem at this scale will certainly help make you a good candidate for any position that involves analysis and critical thinking, and it will provide a concrete example to demonstrate your experience during interviews. On Friday night we will start with a reception where your surprise client will give a brief introduction to the data you will be working with over the weekend and tell you a bit about what they would like to get out of it. The data will likely be much more complex than what you are used to seeing in your classes, and you will be given free reign to analyze it however you like. In other words, you will come up with a research question that is of interest to you, and conduct the appropriate analysis to answer your question. But you are welcomed, and encouraged, to take cues from the client’s introduction when shaping your research question(s). Presentations and judging begin Sunday afternoon. Each team gives a brief (5 minute) presentation of their findings to a panel of judges comprised of faculty and professionals from a variety of fields. Prizes will be awarded at the Winners Showcase later in the afternoon.